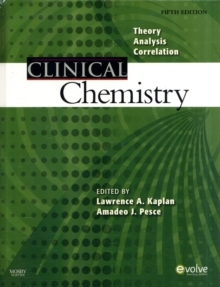 From the classroom to the lab, this text provides complete coverage of the latest advances in clinical chemistry. Part one of the text includes content on laboratory techniques and practice, and part two provides detailed descriptions of how specific diseases affect the human body. Plenty of user-friendly features including outlines, key terms, objectives, and internet references make even difficult concepts easy to understand, and the new full-color insert illustrates important concepts in vibrant detail. Full coverage of clinical chemistry from experts in the field gives you a solid foundation for transferring from theory to practice. New chapters on Laboratory Analysis of Hemoglobin Variants, Laboratory Approaches to Serology Testing, and Viral Hepatitis: Diagnosis and Monitoring keep you at the cutting edge of your field. Key Concept boxes provide short summaries of key content to help you quickly review information.